Home » Diet & Food » These Yogurts Aren't Made With Milk. Is That a Good Thing? These Yogurts Aren't Made With Milk. Is That a Good Thing? 04-10-2019 Comments Off on These Yogurts Aren't Made With Milk. Is That a Good Thing? Remember when the only decision you faced in the grocery store yogurt section was plain or flavored? Now there’s Greek yogurt, Icelandic yogurt, Australian yogurt, drinkable yogurt, and even lactose-free yogurt. All this is not necessarily bad. A 2018 study found that men who eat yogurt typically weigh less, have lower BMIs, smaller waists, and less body fat than men who don’t eat yogurt. But here’s the thing: while Americans still think cow’s milk is the healthiest of the milks, according to Mintel, one in five people are also consuming less dairy for various health reasons. I like dairy-based yogurt for their protein. “Original” yogurt has somewhere around 8 to 12 grams of protein depending on the variety and brand. Greek yogurt gives you a nice bump: clocking in in the low 20s. Skyr—the Icelandic yogurt—falls in between OG and Greek at around 15 to 17 grams per serving. I typically recommend plain yogurt to avoid the added sugars, but there’s an exception or two when it comes to plant-based yogurts. Ideally, though, you’d stick to plain flavors and doctor it up yourself with fruit and/or a little sweetener of your choosing. Chances are you’ll still come in with fewer grams of added sugar than a flavored version. Most alt-milk yogurts are a decent source of protein. Plus, each one also has at least one other unique nutrition benefit. Here’s a breakdown. This variation has the potential to deliver the most protein of the alt-milk yogurts with as many as 9 grams per serving for some brands (other brands clock in around 6 grams). And generally speaking, it’s nutritionally very similar to original yogurt with amount of carbs and protein. Because it is the original plant-based yogurt, it’s the easiest to find and also typically your most delicious substitution. Among one of the more protein-rich alt-milk yogurts, this variety delivers 7 grams protein per serving. It hits all the allergen-free notes: dairy-free, nut-free, soy-free, coconut-free. 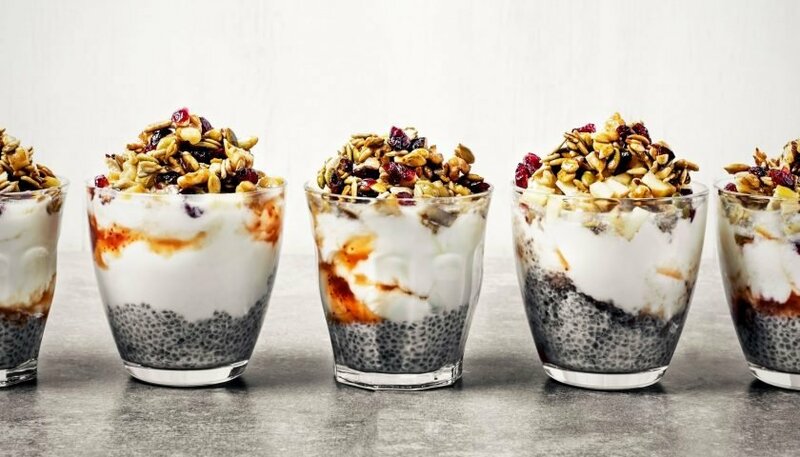 You also get some of those good-for-you (plant-based) omega-3s, which you won’t find in decent amounts in other yogurts. This nut-milk-based yogurt comes in third protein-wise, with around 6 grams. Its standout nutrition quality, surprisingly, is fiber. Some brands mimic the creaminess of original yogurt well, while others seem too watery and better suited for smoothies. Shop around if almond yogurt is your preferred choice. This is one of the outliers—it has around 2 grams protein, which isn’t surprising given how low in protein cashew milk is (less than a gram per cup). Plus, the sole major brand on the market blends in a little coconut cream and that’s devoid of protein (see below, folks). Unless you find one fortified with vitamins, minerals, protein, or fiber, cashew yogurt doesn’t offer much else nutritionally. From a taste perspective, unless it’s flavored, it’s in need of some toppings. Protein is non-existent (unless a brand adds protein powder and some do), but fat isn’t always as high as you’d expect. That said, watch out for the ones made with coconut cream. Although it’s downright delicious and oh-so-decadent, it’s quite high in fat because—hello—it’s made with cultured coconut cream, not coconut milk. The main catch when it comes to plant-based yogurt—if it’s how you choose to eat—is this: Alt milk yogurts typically have longer ingredient lists, some of which are unrecognizable names, though typically benign (think: emulsifiers and thickeners). So if you’re aiming to eat “cleaner,” these yogurts could technically derail those efforts. Cow’s milk-based yogurts—whether it’s original, Greek, or Skyr—have the simplest ingredient list in the yogurt aisle: milk and probiotic cultures. One final word of awareness: If you’re using an alt milk yogurt in place of dairy (be that milk or yogurt), look for one that’s fortified with vitamins and minerals like calcium. That way you’re still getting those key nutrients that you’d typically get from a cows’ milk-based product, but not necessarily from somewhere else in your diet.